Homepage. This page: An offer to view and test drive the latest Austin 20 saloons and touring cars. The Austin Cars Motor Show in 1921, at Vincent's of Reading. 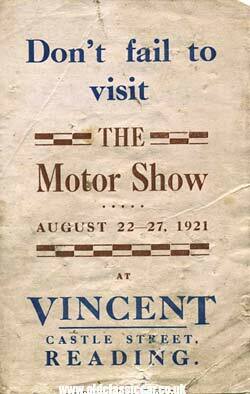 This interesting folded leaflet was given away by W. Vincent of Reading, a motorcar dealer of the 1920s. It announced a Motor Show being held at their Castle Street premises, due to be held during the week of August 22nd - 27th 1921. Prospective purchasers would be able to view the latest Austin models, and book themselves a test drive in an Austin Twenty - apparently "The finest value ever offered in Automobiles". 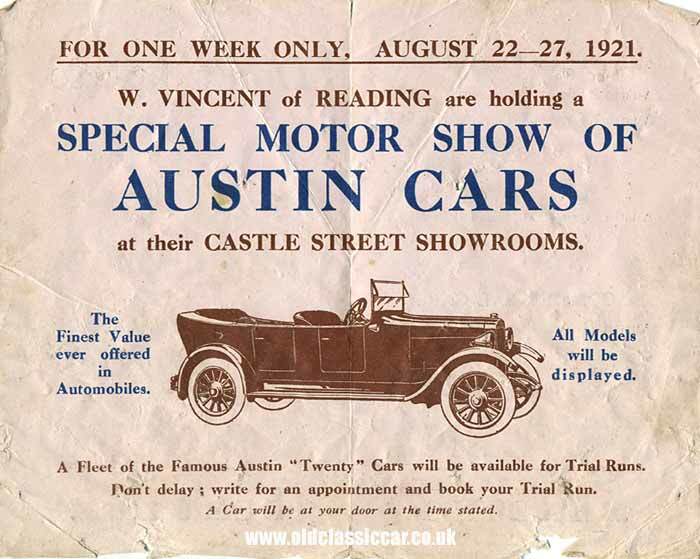 Open the leaflet and more details of the show, presenting what are now vintage Austins, are given, with an illustration of a four door Austin 20 touring car. A fleet of Austin 20 cars would be available for Trial Runs, prospective Austin buyers simply needed to write for an appointment (no telephone) and a car would delivered to their door, at the time stated. In those days of coachbuilt vehicles, the potential customer was advised that "Any type of body (could be) supplied to order by Vincent, Castle Street, Reading". Shown below is an advert from 1920, presenting a smart Austin 20 tourer and it's equally smart driver and passengers. 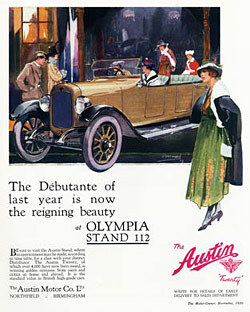 This advert coincided with the motor show being held at Olympia in that year. Image courtesy of the Lord Price Collection.